Congratulations for a God-given reunion to Christine and Huk of Centreville! 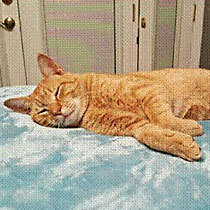 Huk, a beautiful orange male tabby cat, arrived as a stray during the summer. He worked his charm with the family and it was soon evident that he had found his forever home. Everyone fell in love with him, even the family dog. The family made the decision to keep him and made plans to have him neutered. On December 8th, he was loaded into the car on his way for the surgery. In the parking lot of the vet’s office, Huk escaped from his owner and proceeded to lead them on a chase in the immediate vicinity of the veterinary hospital. The situation was very distressing because Huk was in unfamiliar territory, more than 10 miles away! The owners searched for him endlessly, put flyers up everywhere, posted him as missing on social media and enlisted the help of Dogs Finding Dogs. K9 Keelah located Huk’s scent in a brushy area several blocks from the vet’s office which was probably where Huk spent his first night. Huk’s owners were reassured that their cat was very street-wise and that he would probably show up on someone’s doorstep, just as he had done with them. HERE COMES THE MIRACULOUS PART OF HUK’S STORY!!! On December 20th, the owner was going through her normal morning routine. One of her cats was agitated and kept going over to the sliding glass door. The owner went to the door and looked outside. Who was sitting outside clamoring to get inside? IT WAS HUK!!!! This amazing cat traveled approximately 12 miles, crossing the 301 interstate and other busy roads. It took him 12 days, but he found his way home. His paws showed a lot of wear and he was very hungry, but surprisingly, he was in excellent shape. This is truly a testament to his will to return home. The entire family is grateful for their Christmas miracle and they are awed by Huk’s love for them demonstrated by his determination to return home where he had been loved and cherished. I just wanted to thank you and your dog for all of your help with helping me find Huk. You told me to never give up hope and kept me being optimistic about his return. I am glad that your company takes the time and helps pet owners find their lost pets. It’s a nice peace of mind. Happy holidays.